To fully enjoy your pool during swim seasons, it is important to make the water as accommodating and balanced as possible. Under adding chemicals or over adding chemicals to your water can create potentially unsafe conditions for anyone that gets in it. If you are ready to make the most of your swim time this year, use this guide when finding your pool water balance. 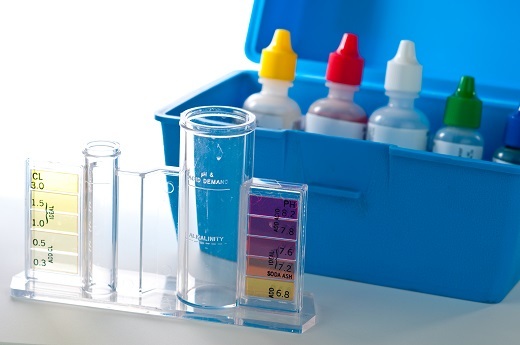 Investing in a pool test kit lets you quickly and easily determine what chemical levels are currently off in your water. With products like the AquaChek Digital Tester and AquaChek TruTest strips, you can test for important chemical ranges including free chlorine, pH, and total alkalinity levels. Once these levels are known, you can easily begin perfecting your water. When adding your chemicals it is important to adjust them one at a time to ensure they don’t counteract with each other. In most cases, you will want to adjust your alkalinity first, then pH and then add chlorine as needed. Once the chemicals are inserted, follow the directions on the packaging to ensure the best results and achieve your desired pool water balance. No matter what pool chemicals you need, we are sure to have them! Once the chemicals have been added, it’s important to run the pump for an extended period of time to distribute the chemicals throughout the water. Once the chemicals have been added, it will likely take some time for the water to adjust and be capable of being entered. Don’t forget to look at the packaging to determine how long you need to wait. This is incredibly important to keep in mind when shocking the pool especially.